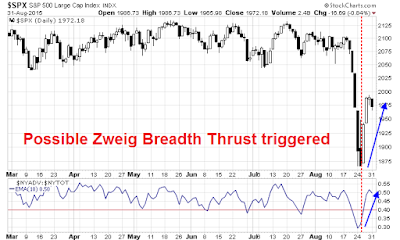 An example of the Zweig Breadth Thrust buy signal occurred at the market bottom in 2009. Then, it took seven days for the indicator to complete its task. To be sure, not all setups turn into buy signals, but failed setups are not necessarily bearish either. Here is an example from 2011, when the SPX corrected, chopped around for a few weeks and flashed a Zweig buy signal setup. 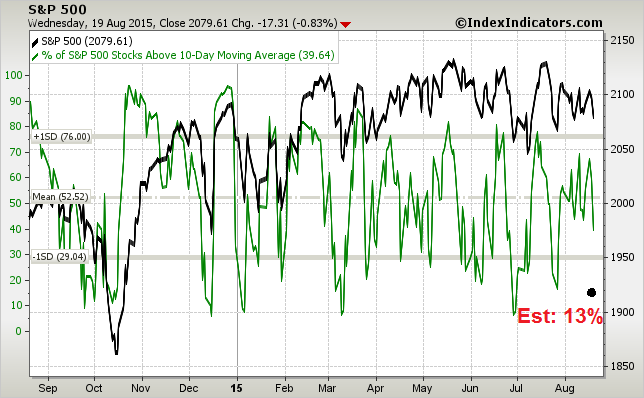 The Breadth Thrust Indicator almost achieved a buy signal in the 10 day window on day 9, but missed. It did manage to get over the 61.5% mark on day 15 - too late. Nevertheless, the market did bottom out that summer and proceeded to rise steadily for the next four years - until the recent correction. 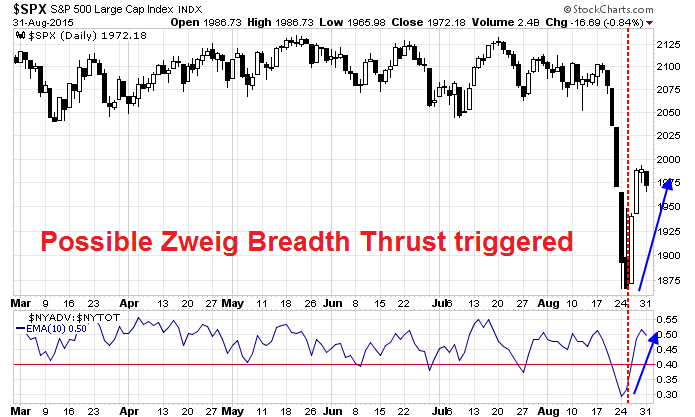 As Zweig Breadth Thrust signals are very rare, I am not counting on the current episode to flash a buy signal, which would be indicative of a V-shaped bottom. 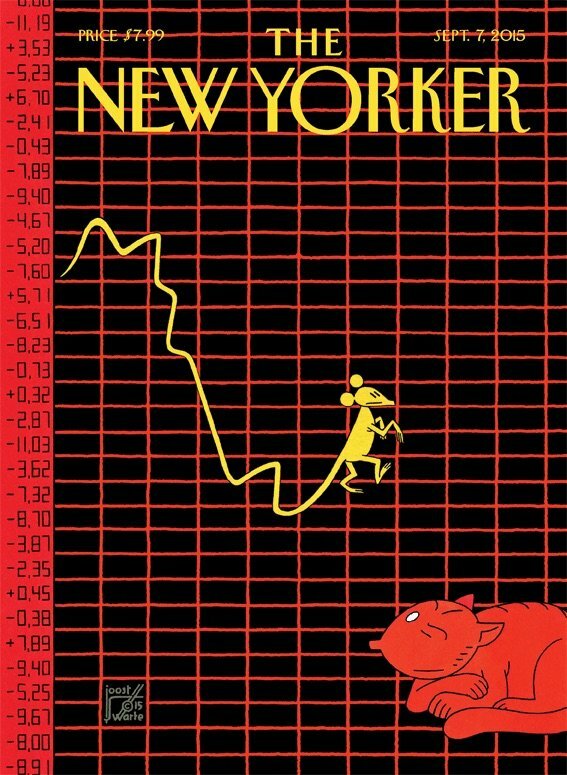 The bulls do have the help of the magazine cover (contrarian) indicator in its favor. 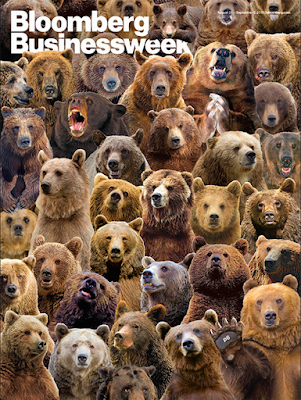 The latest Businessweek cover is full of bears. If the rally is the same scale as it was in 2009, then an equivalent level for the SPX would be 2163, which would represent an all-time-high. If the rally in 2011 had hit its 61.5% target in 9 days, then the SPX would have to get to 2072. If the rally in 2011 had hit its 61.5% target within the 10 day window instead of 15 days that it did, then the SPX would have to get to 2130, or a test of the previous highs. None of these targets are easy, but the two lower ones are somewhat plausible and possibly achievable. I will be monitoring this indicator and report back should it flash a buy signal, on or before the end of the 10 trading day window. Wow! The great big smoking crater in the stock charts is the financial equivalent of surveying the damage from the Tianjin explosion. To say that much technical damage has been done is an understatement. 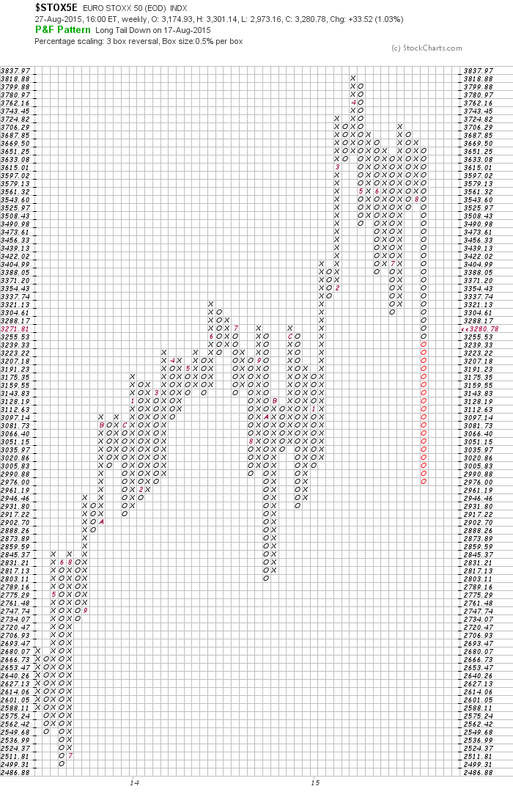 For the sake of consistency, I will be showing the weekly point and figure charts of different market indices, all with a 0.5% box and a 3 box reversal. This is a chart of the broadest US market index, the Wiltshire 5000, but the picture for all of the US indices look more or less the same. The uptrend has been decisively broken. 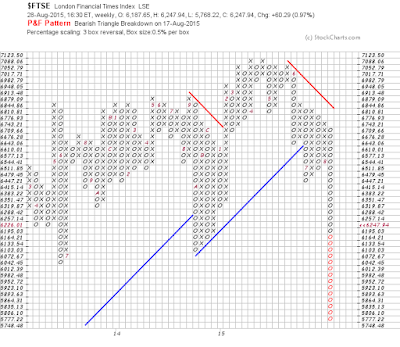 Across the Atlantic, here is the UK`s FTSE 100. The pattern looks ugly. On the Continent, here is the Euro STOXX 50. In Asia, here is Hong Kong Hang Seng Index. 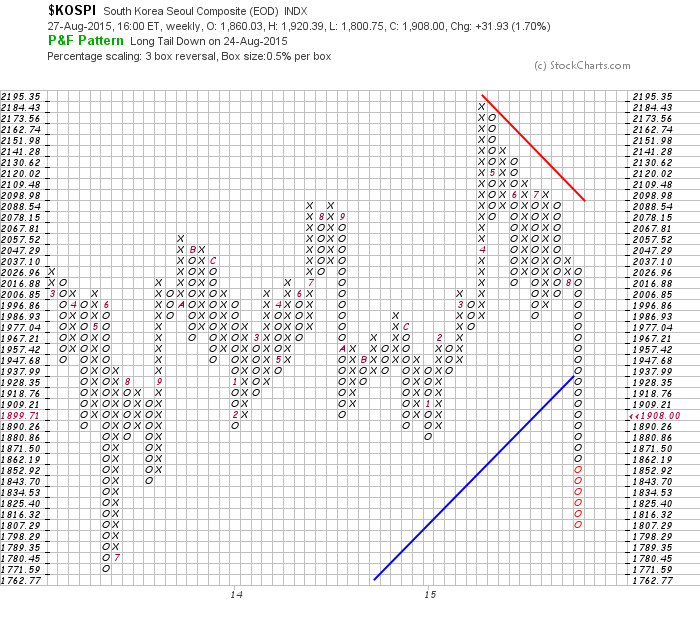 South Korea`s cyclically sensitive KOSPI Index. I could go on, but you get the idea. 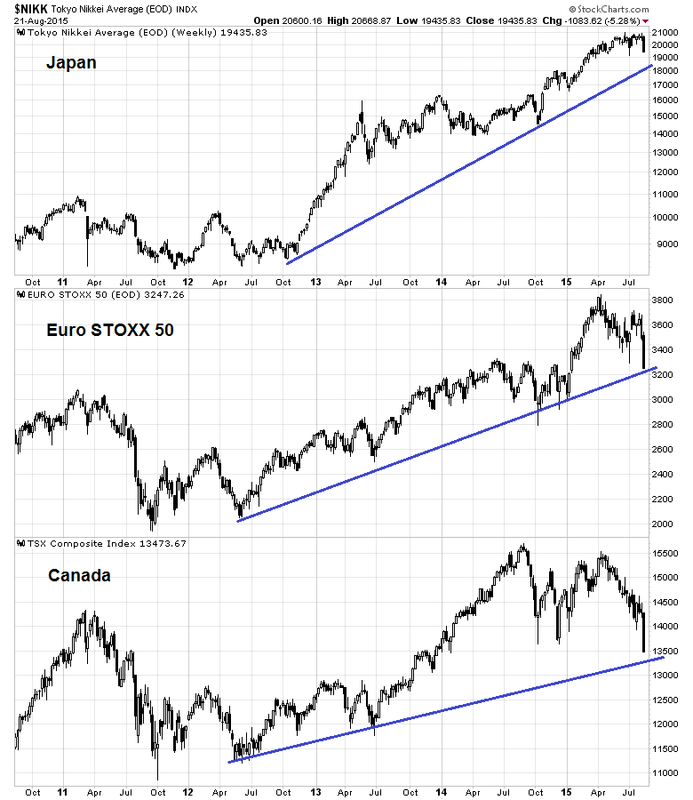 These are weekly charts going back several years - and the obvious technical conclusion that can be drawn is that the bull run of the last few years is over. On an intermediate term basis, all of my technical training tells me that there are really only two ways forward from here. Either the market bottoms here or this is the start of a bear market. The stock market was obviously very oversold right now and it is bouncing. Once the reflex rally peters out, either the SPX consolidates sideways and bases, which does not rule out a re-test of the lows, or this is the start of a bear market. In that case, the market weakens to new lows after the bounce. Under the bear market scenario, the key question then becomes whether the market is re-tracing its upward move from the bottom formed in 2011 or in 2009. While initial support exists at the 1820-1860 area, Key Fibonacci downside targets for a 2011 retracement would be at about the 1730 and 1600. 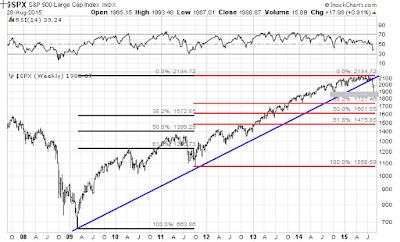 By contrast, the initial downside targets of a 2009 retracement are 1570 and 1400. Any way you look at it, those targets are a long way down from here. 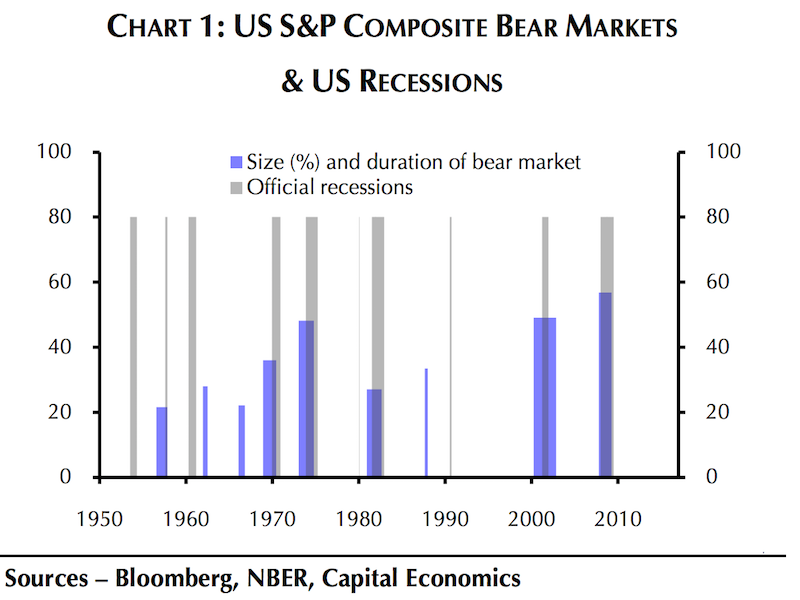 On the other hand, the macro and fundamental strategist in me rebels against the idea of a bear market. In order for stock prices to go down, the slow (but big) institutional money has to have a fundamental reason to sell. Frankly, I can't find any at the moment. Overly aggressive Fed tightening: The Fed tightened twice in a week in September 1987, just ahead of the October Crash. War and insurrection: Imagine your country has been taken over by either an unfriendly power. They're rounding up people and executing them at the local football stadium. You are faced with the permanent loss on the value of your assets and maybe your life. Under those circumstances, the value of your stock portfolio is probably the least of your worries. None of those conditions are in place right now. 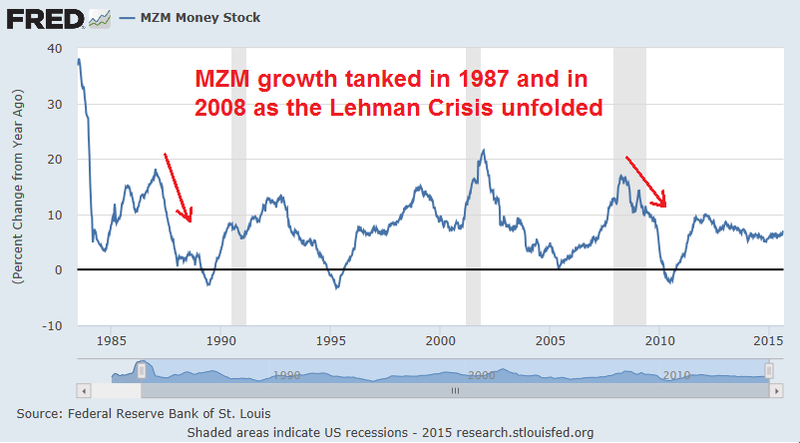 Consider the first criteria of pending recession. The latest Q2 US GDP report last week came in at 3.7%, a full 0.5% ahead of expectations. The economy is robust enough that the Fed is contemplating raising interest rates. Recession? You've got to be kidding me. In addition, monetary conditions are far from being tight. 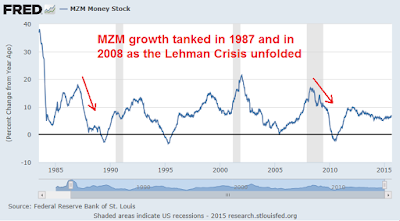 The chart below of YoY MZM growth shows that money growth was decelerating into the Crash of 1987 and the Lehman Crisis. Today, growth in the monetary base remains benign. 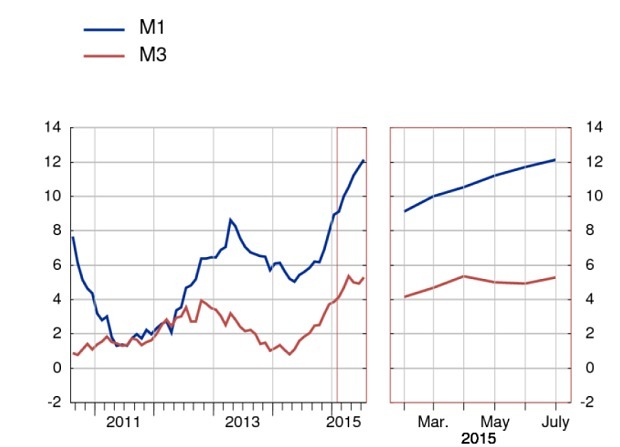 Across the Atlantic, monetary conditions are also highly accommodative. Ambrose Evans-Pritchard pointed out that eurozone money growth is accelerating as the ECB is flooding the system with liquidity. Nope, no sign of overly aggressive central bank tightening here. 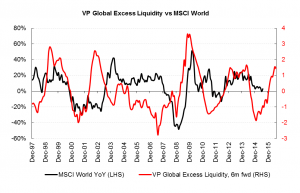 As well, Variant Perception pointed out that global liquidity is on the rise. Such conditions have been highly equity friendly in the past. What about valuation? 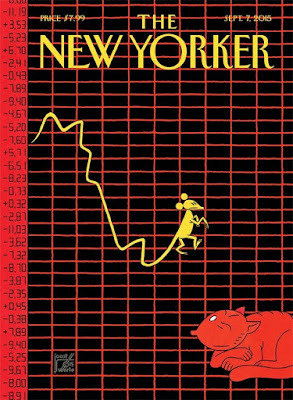 In 2000, the reversion in the valuation of the high flying Tech, Media and Telecom stocks pushed the economy into recession. Analysis from Morningstar shows that the median stock is moved from overvalued to 7% undervalued. Another a bullish signal of the equity friendly environment is the behavior of the "smart money" corporate insiders. Insiders have been buying this market weakness since mid-July and increased their buying last week, according to Barron's. 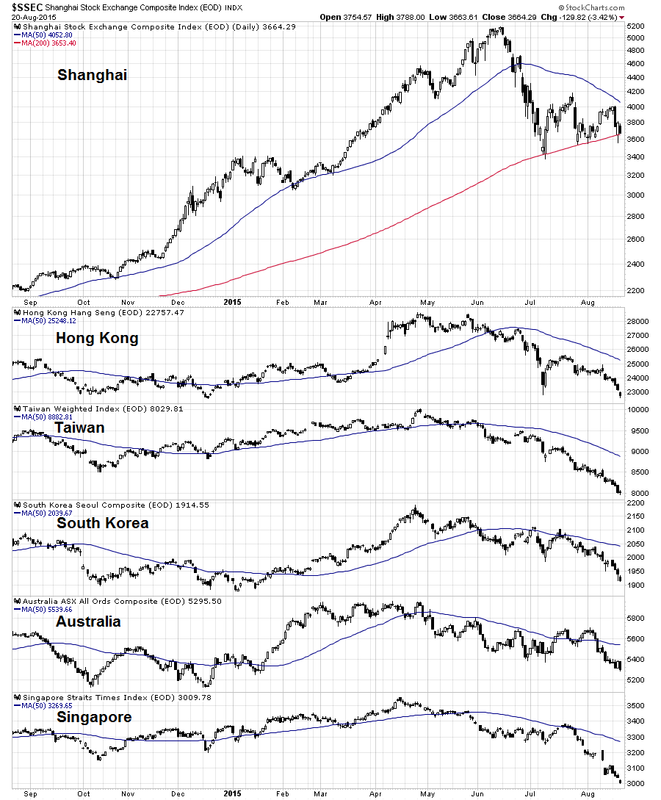 The key macro risk for global market is the deflationary forces coming from China, which has already leaked into emerging market countries and resource-based economies. Already, there are reports of hot money fleeing Latin America. Can Chinese risk be contained? Is it any wonder that stresses are showing up in the system? So is this the hour of China’s crisis? Highly unlikely. Though the economy faces grave problems, the financial tumult is misleading. China’s stockmarket has long been derided as a casino, and for good reason. The bourse is small relative to the economy, with a tradable value of a third of GDP, compared with more than 100% in developed economies. Stocks and economic fundamentals have little in common. When share prices nearly tripled in the year to June, they no more reflected a stunning improvement in China’s growth prospects than their collapse since then has foreshadowed a sudden deterioration. Less than a fifth of China’s household wealth is invested in shares; their boom did little to boost consumption and their crash will do little to slow it. Punters borrowed lots of money to buy stocks in good times, to be sure, and some of that debt will default. But it amounts to just 1% of total banking assets, a potential hit that, although unpleasant, is hardly systemic. The property market matters far more for China’s economy than equities do. Housing and land account for the vast majority of collateral in the financial system and play a much bigger role in spurring on growth. Yet the barrage of bearish headlines about share prices has obscured news of a property rebound. House prices have perked up nationwide for three straight months. Two months after the stockmarket first crashed, this upturn continues. Despite the recent weakening of growth momentum, policy flexibility for policymakers continues to buoy expectations for a rebound in growth, in Goldman's view. On the monetary front, the bank suggests the People's Bank of China will follow up on Tuesday's interest and reserve ratio requirement (RRR) cuts, predicting another rate cut of 25 basis points along with two additional 50-basis-point reductions in the RRR. Fiscally, Goldman expects local-government debt swaps — allowing entities to swap shorter-dated, higher-yielding debt into longer-dated, lower-yielding debt — to continue while public-private partnerships are enhanced. It also expects the PBOC to increase direct lending to policy banks, something it thinks "should further improve investment demand, in addition to higher political pressure from the Central government on local officials to invest." On reforms that could potentially boost growth, the bank suggests they will be rolled out in the areas of demographic policy, social safety nets, and environmental protection, along with reform of state-owned enterprises. With all those factors, particularly on the fiscal front, potentially on the way, Goldman expects fourth-quarter growth of 8.0% (quarter-over-quarter annualized), up from 7.5% expected in the third quarter. While we don't know if we have just passed the key turning point, we think that it should now be apparent that the risks of deflationary contractions are increasing relative to the risks of inflationary expansion because of these secular forces. These long-term debt cycle forces are clearly having big effects on China, oil producers, and emerging countries which are overly indebted in dollars and holding a huge amount of dollar assets—at the same time as the world is holding large leveraged long positions. While, in our opinion, the Fed has over-emphasized the importance of the "cyclical" (i.e., the short-term debt/business cycle) and underweighted the importance of the "secular" (i.e., the long-term debt/supercycle), they will react to what happens. Our risk is that they could be so committed to their highly advertised tightening path that it will be difficult for them to change to a significantly easier path if that should be required. To be clear, we are not saying that we don't believe that there will be a tightening before there is an easing. We are saying that we believe that there will be a big easing before a big tightening. We don't consider a 25-50 basis point tightening to be a big tightening. Rather, it would be tied with the smallest tightening ever. 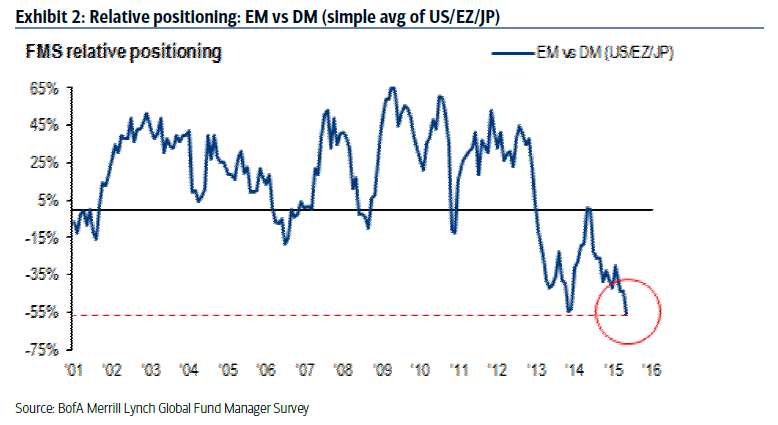 As for issue of emerging market contagion risk, Greg Ip at the WSJ wrote that EM economies are far more insulated from a foreign currency crisis than they were in 1997. Broadly, Asian FX reserves can be judged to be adequate, with the exception of Malaysia, where FX reserves now barely cover short-term debt. In comparison to their status prior to the Asian Financial Crisis, Asia’s fundamentals are (broadly) in better shape. Consequently, we are unlikely to see explosive FX weakness. But other factors are at play, including large debt overhangs in some countries, the sharp decline in commodity prices and political uncertainty in some countries. On the other side of the FX equation, we expect US Dollar strength to continue on the back of solid US growth and the prospect of Fed tightening in coming months. We therefore expect Asian currencies to continue to depreciate. If ZH can`t make a bear case, then what reason is there to be bearish? “We expect the U.S. economy will avoid contagion and continue to expand. 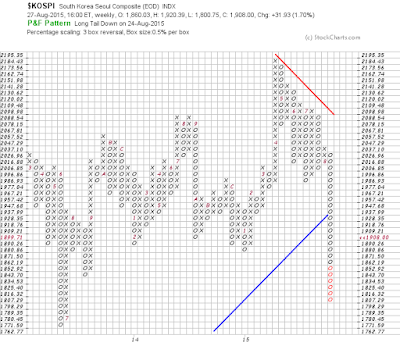 [The] S+P 500 will rise by 11% to reach 2,100 at year-end. Such a rebound would echo the trading pattern exhibited in 1998, when U.S. equities rallied and largely ignored the Asian financial crisis,” says Kostin. History shows that stock markets tend to recover within three to four months following the end of a correction, he notes. In conclusion, China's problems aren't over. Their growth is slowing and it will negatively affect emerging market and resource-based economies. However, contagion risk is fairly limited and, should stress levels rise, the combination of intervention by Beijing and global monetary authorities are likely to kick the can down the road yet one more time. As I write these words, stock prices have rebounded strongly from last Tuesday's lows. However, a read of the message boards and my Twitter feed shows that the technical consensus is bearish and calls for a short rebound, followed by a decline to new lows, or at least test the previous lows. In short, we have a lot of fast money itching to short into this rally. The bearish consensus may actually be contrarian bullish. 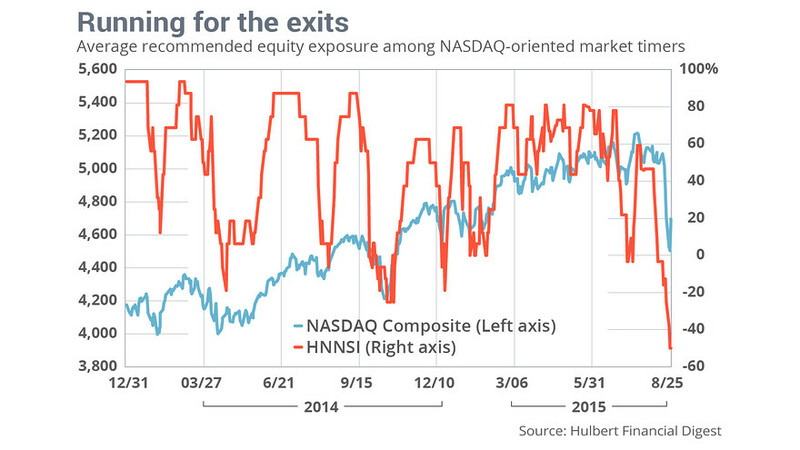 According to Mark Hulbert, who found that NASDAQ timers' equity exposure is at a five year low (and did not budge despite the rally late in the week). Standard technical analysis calls for a major SPX resistance level at 2040, which was old support turned resistance, further resistance at about 2075, which is the site of both the 50 and 200 dma, followed by 2100, which has acted as a barrier for much of 2015. 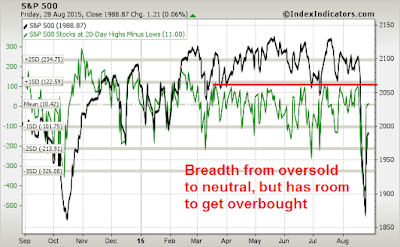 Breadth indicators, such as this one of the net 20 day highs-lows from IndexIndicators, show that the market has swung from an extreme oversold reading to neutral. The momentum of the move suggests that there may be a couple of days left in the rally as the indicator is not overbought yet. My base case scenario is an approximate repeat of the 1998 market, with the caveat that history doesn't repeat, but rhymes. I will be waiting for the other shoe to drop in the days and weeks to come. How will the technical internals develop? How will sentiment metrics change should the strength continue? 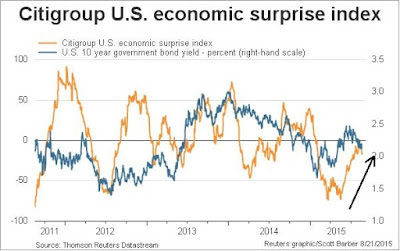 More importantly, what are the positive and negative surprises lurking around the corner? A possible bullish surprise could come from policy action. Supposing, that after all of the central bankers confer at Jackson Hole this weekend, they become concerned enough about emerging market contagion risk (such as the move by Turkey to prepare for rising short-term US rates) that they announce coordinated central bank intervention. The Federal Reserve, BoE, ECB, BoJ, SNB, BoC, etc. all announce that they have established very large or unlimited swap lines to a large list of EM central banks, including the PBoC. For the uninitiated, swap lines are the way that central banks borrow at the equivalent of the Fed window. Imagine that a Chinese financial gets into trouble over its USD loans. It cannot go to the Fed window to borrow because it is not under Fed supervision. A swap line allows it to borrow USD from the PBoC, where the PBoC obtains the funds by swap line facility at Fed window rates. In this way, it is the PBoC that is on the hook for the USD facility from the Fed. Such an announcement amounts to a statement by global central bankers standing ready to flood the global financial system with liquidity should it become necessary. Should such a scenario unfold, bearish traders would have to think twice about trying to shoot against the liquidity flood unleashed by central bankers. If, on the other hand, there is no policy response. The consensus technical analysis projection would be for the market to weaken and test its lows. Not so fast! 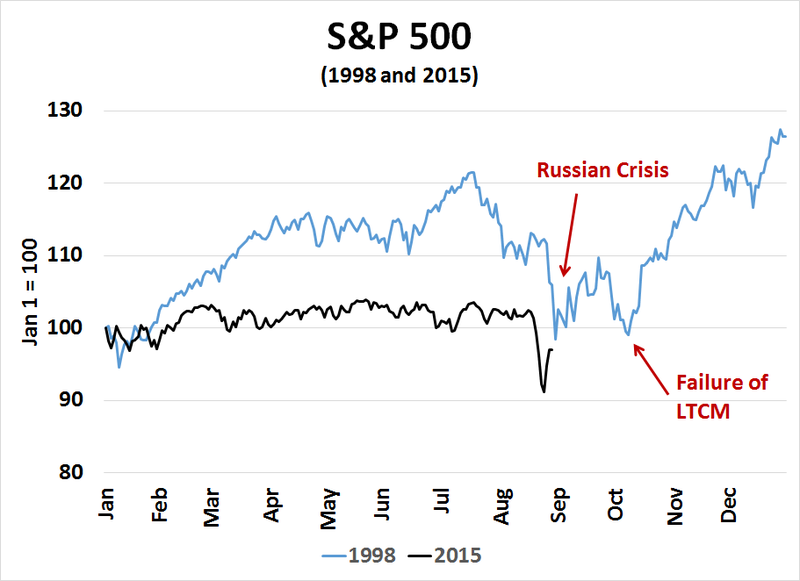 Even if we were to use 1998 as a template for today's market, recall that the first leg down was attributable the Russian default, while the second leg to test the lows was sparked by the failure of Long Term Capital Management. What could be lurking in the financial system that could cause that kind of crisis in 2015? One possibility is the FOMC decides that the markets have stabilized enough that it can raise interest rates at its September meeting. My inner investor is inclined to accumulate stocks on weakness. He remains neutrally positioned as the rally in bond prices largely offset the fall in stock prices (see The difference between "investors" and "traders"). My inner trader was battered by the downdraft, but he didn't sell. He will likely reduce some of his long positions should prices approach key resistance levels. He is nevertheless watching key technical support and resistance levels, as well as the possibility of both positive and negative macro shocks. 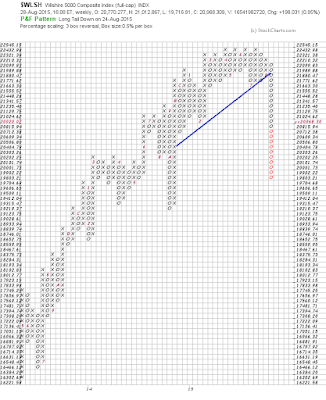 Should the SPX reach some of these resistance levels, he will likely be scaling out of his long positions. We are likely to see some highly volatile markets in the weeks ahead. Under these conditions, it pays to reduce position sizes for risk control purposes, as the swings can be treacherous. The difference between "investors" and "traders"
I received a lot of complimentary comments on my last post (Relax, have a glass of wine) in which I urged investors to take a deep breath and focus on the market fundamentals which indicated that the macro backdrop was tilted bullishly. However, there was a small minority whose comments ran to the tone of the post being ridiculous advice. The latter group undoubtedly were highly short-term focused and belonged to the community of traders. I would like to take this post to distinguish between my two personas, namely my inner trader and inner investor. During the current period of market turmoil, my inner trader has to deal with many challenges, not the least of which are the wild daily and overnight swings in asset prices. By contrast, my inner investor (and underline the term "investor") takes a much more longer term view. The typical "investor" and can only check the market briefly during the day and only trades occasionally. They certainly do not have the time, resources or inclination to be fret over and trade swings in overnight stock index futures. 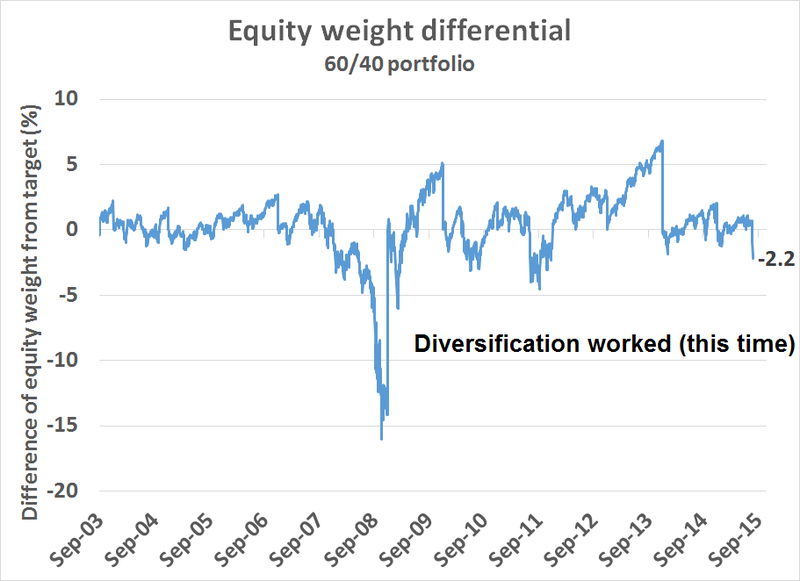 While the recent stock market downdraft has been surprising, the average diversified investor hasn't really been hurt very much. That's because the bond market has acted as a very good diversifier, unlike 2008 when market contagion leaked into the credit markets. To illustrate my point, imagine someone with a portfolio with a passive 60% stocks and 40% bond allocation. He invests the stock portion into SPY and the bond portion into AGG. The simulation assumes that all income is re-invested back into the ETF of the respective asset classes (SPY dividends to SPY and AGG income into AGG). Once a year on December 31, he re-balances the portfolio back to the target 60-40 weight. 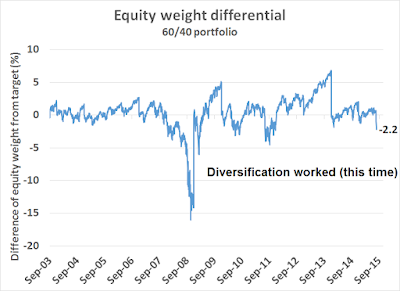 Here is a chart showing how far his equity weight is off his 60% target since September 2003, when the data series for AGG began. As of Tuesday, August 25, 2015, the worst day of the stock market drawdown so far, the portfolio was underweight its stock benchmark by only 2.2%, which means that the bond market rallied enough to make up most of the losses suffered by equities. Contrast that with past experiences in 2008 when the equity weight cratered, or even the correction of 2011 when bond diversification had a less adequate effect. In 2015, diversification worked! Investors who have diversified portfolios shouldn't really be freaking out. So relax, have a glass of wine*. * Investors who made the decision to be 100% equities either made the conscious investment policy decision to assume equity volatility in return for a higher rate of return, or the current episode taught them a valuable lesson on the importance of an investment policy. Years ago, our infant daughter had an accident whose details I don't remember anymore. My wife called an non-emergency line and was connected to a triage nurse, whose job was to try and diagnose the problem over the phone and escalate the matter if it was deemed serious. After listening to my wife describe the problem, the answer was, "Your daughter is fine and she doesn't need anything, but you seem very agitated. You should sit down, relax and have a glass of wine." Today everybody is suddenly a technical analyst, I am going to be contrary and put on my fundamental investor's hat and tell investors, "Sit down, relax and have a glass of wine." Is this going to push the economy into a recession? If not, then is there some factor that will accelerate the selling, such as excessive debt that needs to be unwound, which is the typical causes of market crashes, or technical factors, such as the concentration of delta-hedging portfolio insurance programs in 1987? Consider the proximate cause of the risk-off environment today, namely worries about a China slowdown. 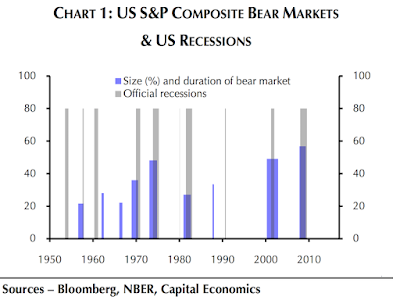 So the question becomes, will a China slowdown push the US, or the world, into a recession? The fact that China is slowing should be no surprise as the data has been coming in over at least the last year that growth has been slowing. These changes are so well telegraphed that the BoAML Fund Manager Survey shows that equity institutional managers have already de-risked their portfolios from the China effect by underweighting emerging market equities and resource sectors (see my last post Is this the Ashley Madison market panic?). This represents unabashedly good news for the suppliers of US capital. So what are you worried about? From a global perspective, the ones who are going to get hurt are the suppliers into China, namely the resource based economies (Australia, Canada, South Africa, Brazil, etc.) and China`s major Asian trading partners. Unlike past crises, however, there is little excess leverage to unwind and, in fact, the world has been deleveraging and eschewing debt in favor of cash. Remember, these are USD debts that are not in the US banking system and therefore beyond the direct control of the Federal Reserve. 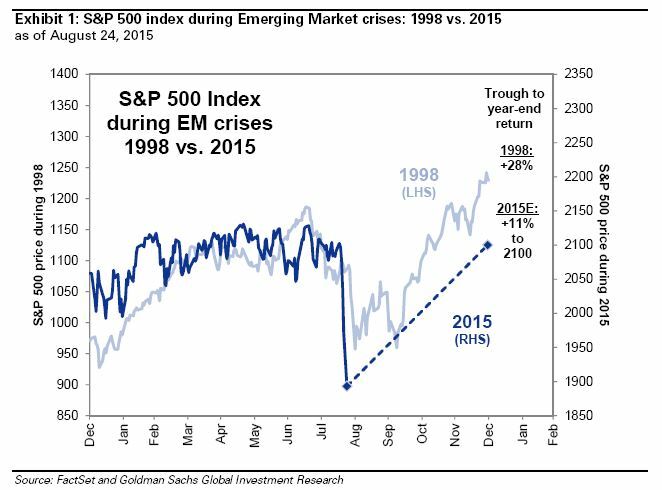 What would happen do should events start to turn south in the EM economies? First of all, the key risk here is not some company going under because they got offside on their debt, but companies and countries getting in over their heads in foreign currency debt (in this case USD) and then getting hit by enormous FX devaluation. In Asia, monetary authorities learned from the Asian Crisis and had built up large FX reserves. The strongest case is China, where USD 1.1 trillion of offshore debt is supported by USD 3.8 trillion in reserves. Since the onset of the financial crisis in 2007, bilateral central bank swap lines allowing the provision of foreign currency to local counterparties have become an important tool of central bank international cooperation to prevent systemic risk and limit contagion across major currencies. The design and calibration of the operations used by the ECB to provide foreign currency liquidity to domestic banks helped to achieve the key objectives of the swap lines and calmed markets and funding concerns during the crisis. Sit down, relax and have a glass of wine. What can accelerate the downside? So far, I have addressed the first question of whether the financial panic could push the US or global economy into recession. The answer is no, largely because recessionary risks are not present, a China slowdown presents growth opportunities for the US and there is minimal contagion risk. The second question I want to address is whether there are any factors that could accelerate the downside risk. 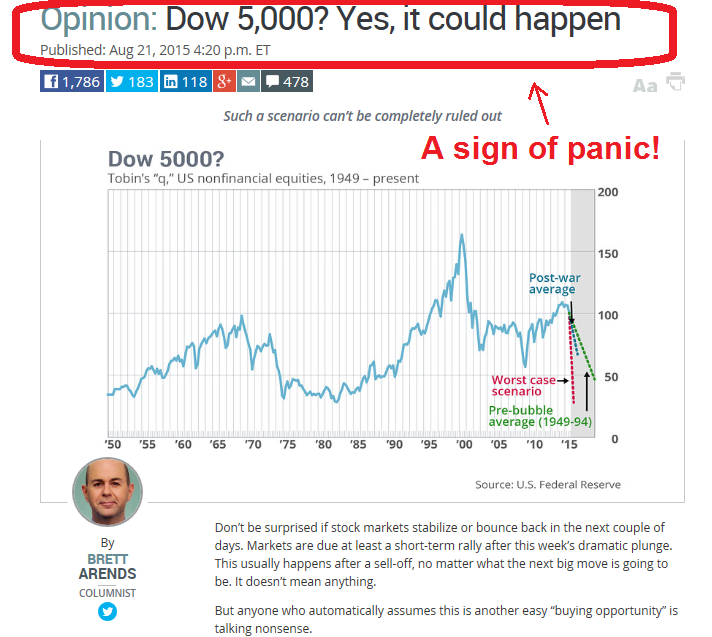 In the past, we have seen financial events that could have sparked financial panics, but didn't. Examples include the failure of Barings, which failed to bring down the global financial system (unlike Bear Stearns and Lehman Brothers), and the Dubai World default of 2009. Why Lehman and not Barings or Dubai? The answer is excessive financial leverage. When events go south, financial leverage kills. Today, the world has been reducing debt and balance sheets are in much better shape. Much of the debt has moved from private and corporate balance sheets to the government, which is usually in better shape because their central banks can print money. If you don't believe that, then just remember how many fortunes have been lost in the Japanese widowmaker trade of shorting JGBs. My inner investor tells me that financial panics are great opportunities to step up and buy discounted assets. The world only ends once and it isn't going to end today. In a world where everyone has turned technical, I have turned contrarian and become fundamental, largely because technical support levels are next to useless because the markets are in panic mode. I don't need to cite more statistics about how oversold the market is or how stretched bearish psychology is. 10th October 2008 (Lehman Brothers) – Recovered 75% of break candle in (inside candle) week 2 – after this rally resumed overall downtrend. 21st September 2001 (Tech Crash) – Recovered 60% of break candle in (inside candle) week 2, full retrace week 3 – after this rally resumed overall downtrend. 1st April 2004 (Bonds Crash) – Marginal new low next day (Monday) to make 1994 low. Closed up 0.5% in week 2, full retrace of break candle in week 9. That Monday low has never been broken since. 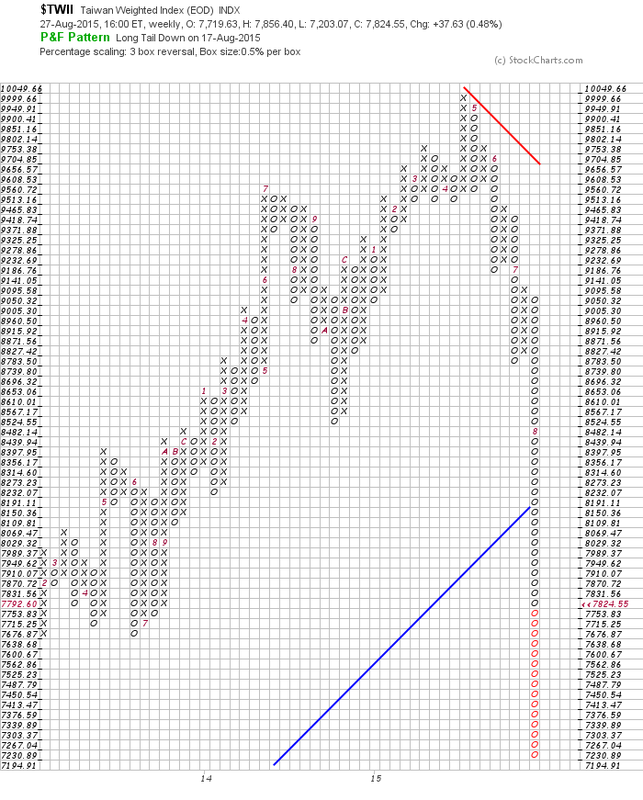 23rd October 1987 (Equity Crash) – Gapped up hard Monday, retracing all of break candle body. Higher low Wednesday. 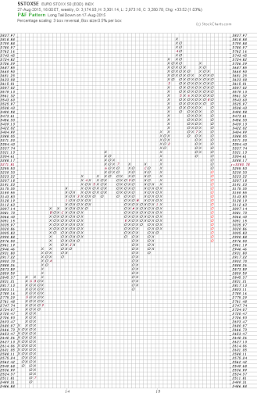 955 of break candle retrace week 3, all in week 13. Break candle low never broken since. 11th May 1962 (1961/2 Bear Market) – Flat open Monday, fell another 2.5% to make intraweek low, closed day up 1%. Closed week 2 up 2%, 60% of break candle retraced in week 3 – after this rally resumed overall downtrend. 24th May 1940 (WW2 Fall of France) – Gapped up hard Monday, never tested lows in week 2, retrace 50% of break candle intraweek, closed at 25% retrace. Marginal new low week 3 and close at 40% low. Marginal new low in week 4 that lasted 17 months and closed at more than full retrace of break candle. 17th May 1940 (WW2 Fall of France) – Gapped down hard into following week and closed week down 8.7% and still well below the 3SD weekly lower band. The moral of this story: Unless the markets are discounting a major military defeat involving the permanent loss of capital, you should relax and have a glass of wine. Is this the Ashley Madison market panic? How deep is a pullback? When I see headlines like this one, you know that panic is in the air indicating that we are at or very close to a tradeable bottom. 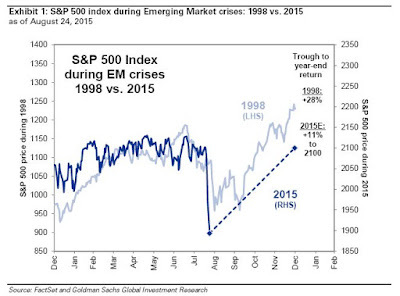 Same-old range-bound 2015: We are experiencing a typical 2015-style short sharp sell-off. 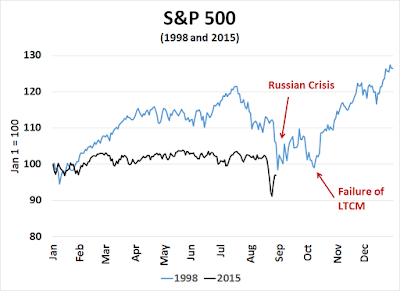 The market will bounce and stocks will continue to stay range-bound as it has in all of 2015. This scenario does not exclude the possibility of new highs this year or next year. 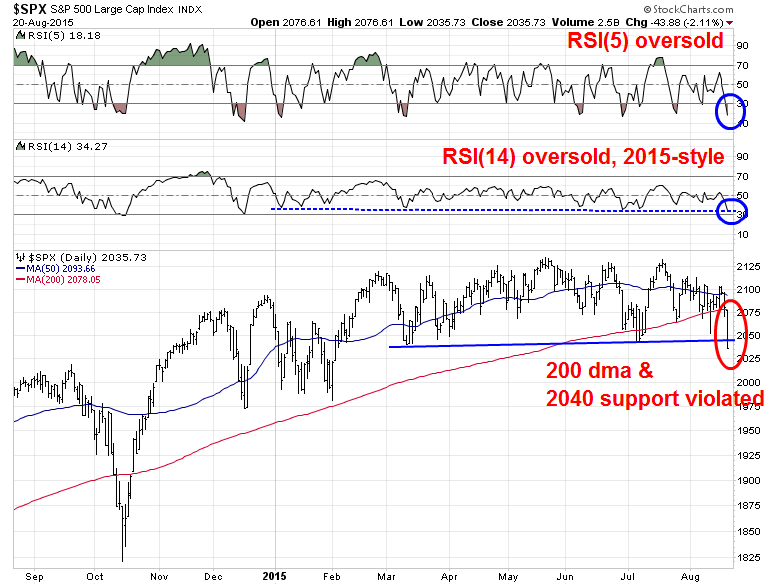 A bounce, followed by a deeper correction: Stocks are too oversold to go down too much further. The stock market will stage an oversold rally, possibly to test the old highs so that bearish sentiment gets washed out. 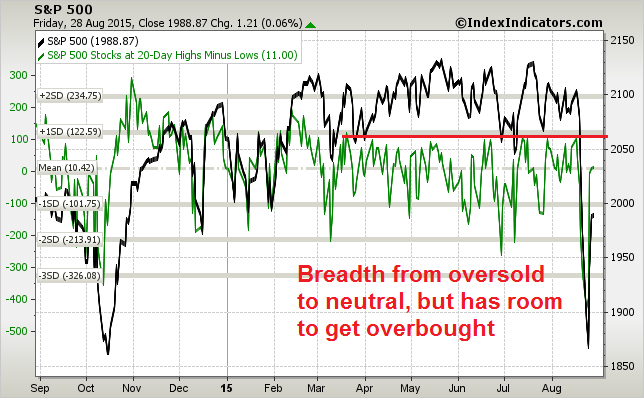 The market will then resolve all of the negative breadth and momentum divergences with a 10-20% correction. 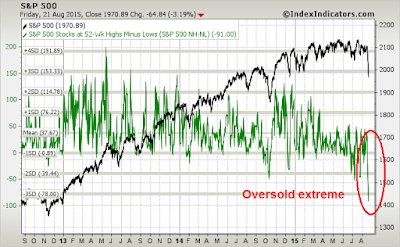 My favorite intermediate term overbought-oversold model falling below 0.5. The chart below shows the signals of this model since the start of 2011. 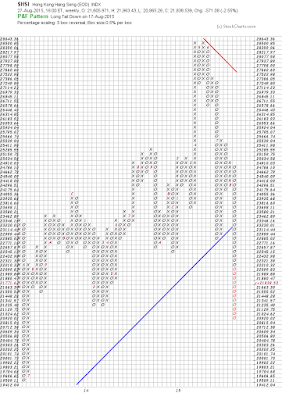 I have shown with vertical blue lines the instances when two of the three conditions have been satisfied and the vertical red lines when all three have flashed buy. 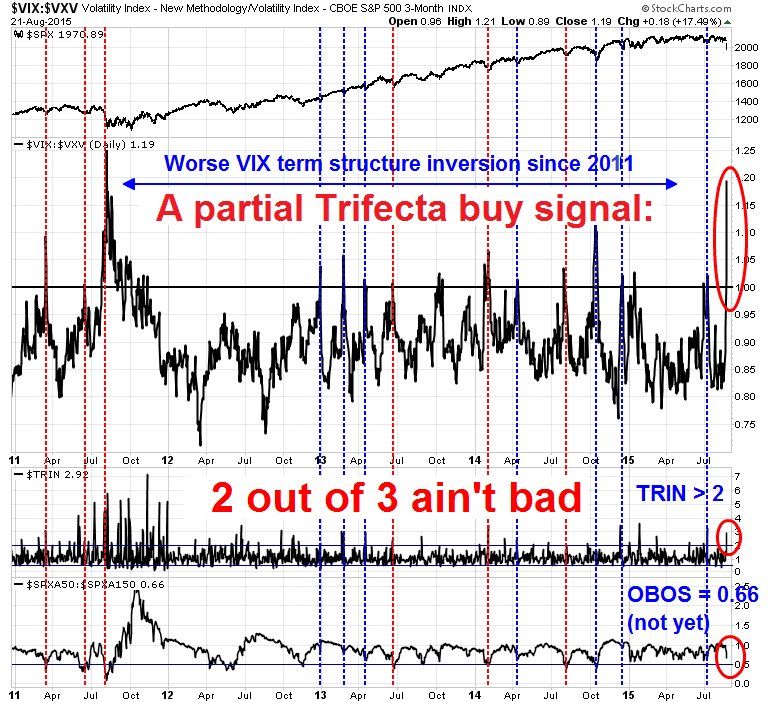 The Trifecta Model flashed a two-signal buy on Friday when VIX term structure inverted Thursday and TRIN closed Friday at above 2. The panic was so bad that the last time the VIX term structure was this inverted was the height of Grexit fears in 2011. What do we have to be worried about today, the Ashley Madison data hack? 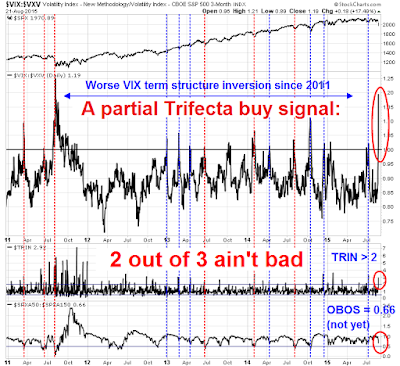 I was watching TRIN readings carefully Friday to see if the Trifecta Model would flash a partial two-component buy signal. The chart below is a 15-minute tick chart of the indicators in question. 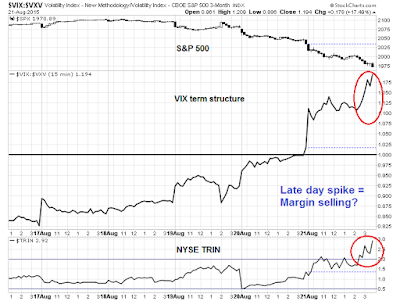 TRIN bounced around all day and saw a late day surge, which is highly suggestive of a "margin clerk" market. This is where member firms sell customer positions to satisfy margin calls late in the day and risk managers forces trading desks and hedge fund traders to either de-risk their positions or reduce their overall position sizes because of higher VaR estimates. In other words, it looks like a classic case of price insensitive capitulation selling. 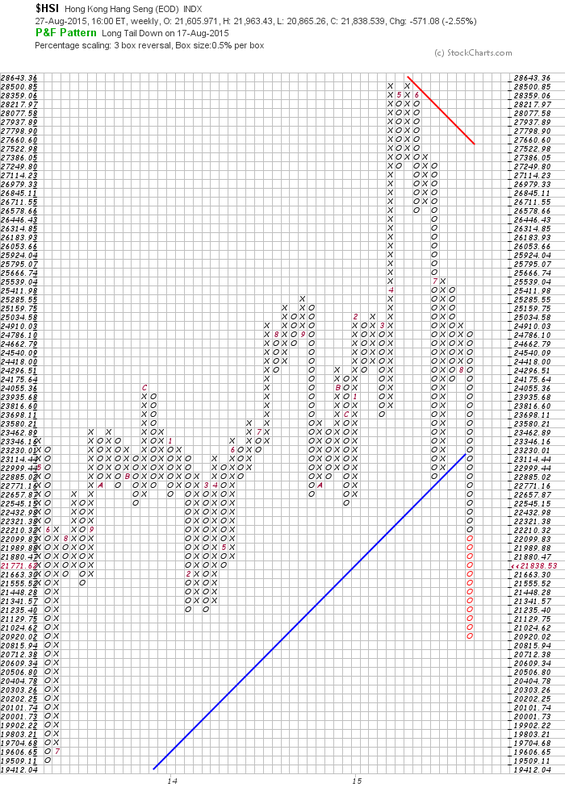 Once the forced selling is done, downside pressure should abate and we are likely to see a melt-up in stock prices. I went on to analyze past market rebounds after a partial buy signal (where only two of the three components of the Trifecta Bottom Model have flashed buys). The resulting reflex rallies have tended to last 10-14 calendar days.There were two instances where the rally only lasted a week, but there was no downside risk as the market consolidated sideways. There were a minority of cases where the bounce was followed by market weakness, such as what we saw in the last two occasions when these signals were triggered, which were in late 2014 and in July 2015. Other measures of selling pressures, such as the Participation Index, confirm my observations about panic selling and forced liquidation. 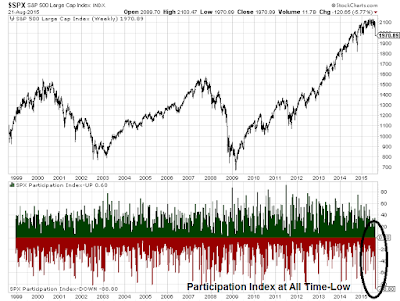 The chart below shows that the Participation Index came in at an all-time low in its history last week. The selling pressure was worse than the bursting of the Tech Bubble in 2000 and the Lehman Crisis of 2008. How many ways to say "Oversold"? The message boards and my Twitter feed is full of stories about how oversold the market is. 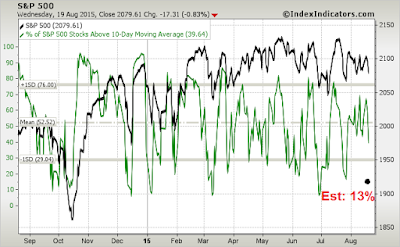 As an example, this chart from IndexIndicators shows the oversold condition of net 52-week highs-lows, an intermediate term indicator, is at an extreme. 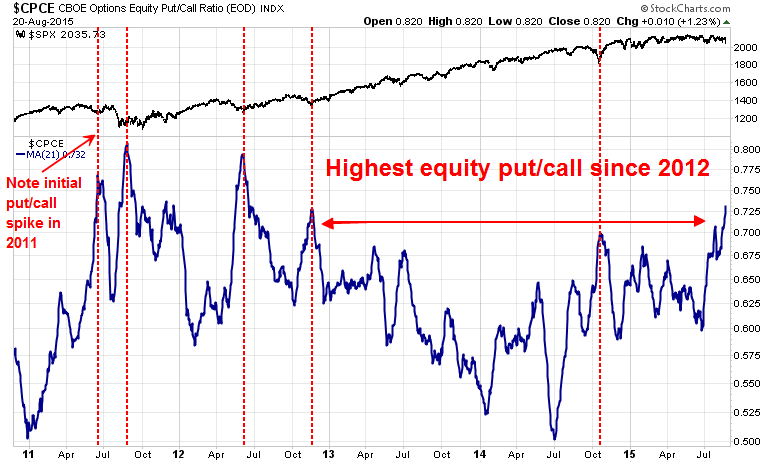 As well, the CBOE equity put/call ratio is showing a reading not seen since the bottom of the pullback in August 2014 and at the depths of the sell-off in 2011. It also offers a clue of what might happen next. Both the first sell-off in 2011 and the August 2014 decline saw three week rallies to test the old highs, followed by further market weakness. 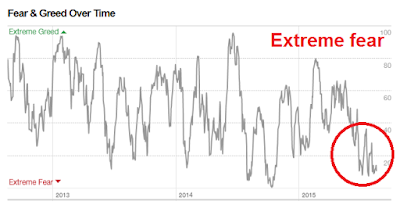 The combination of the analysis of past Trifecta Bottom Model recoveries and the CBOE equity put/call ratio extremes suggest that a typical recovery from these oversold extremes would last 2-3 weeks. After that bounce, we will need to evaluate the macro, fundamental and technical conditions. To be sure, there were bright spots. 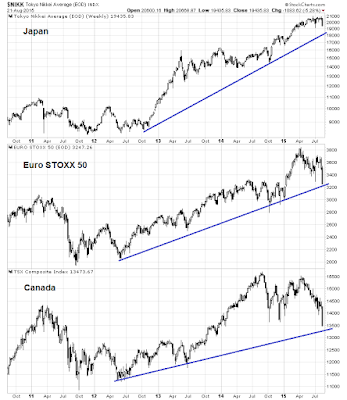 Some major and minor non-US indices whose technical uptrends remained intact, such as Japan, the eurozone and, to my surprise, Canada. Experienced investors know that 5-10% stock market declines happen all the time, sometimes for little or no fundamental reason. In the last couple of days, I am seeing increasingly bearish and dire forecasts coming from many chartists and traders. Regardless of the technical analytical approach taken, one basic principle that everyone can agree one that short-run stock prices are determined by supply and demand. Here is the situation today. Right now, we are seeing a mini-panic among the fast-money hedge fund crowd, day and swing traders and the downside pressure has been exacerbated by forced selling by margin clerks and risk control officers. In order for the technical damage that we have seen to manifest itself over the coming weeks and months, the slow and big money institutions need good macro or fundamental reasons to sell stocks, which I am not seeing right now. Consider the position of the typical institutional fund manager, who is managing tens or possibly hundreds of billions in assets. They move slowly because they take months to move in and out of positions, but once they start to move, there is size behind those flows. What would make an institutional manager de-risk and sell US stocks? 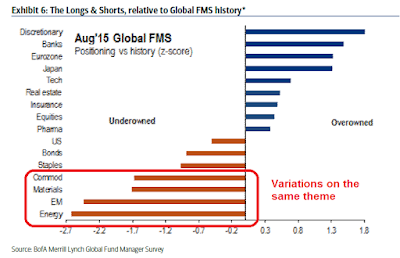 Are equity fundamentals deteriorating? Nope. Ed Yardeni shows that forward EPS estimates, which is a key measure of institutional sentiment, are rising (annotations in purple are mine). OK, if the E in the P/E ratio isn't falling, could the P/E ratio contract and cause stock prices to fall? Nope. The discount rate is a function of interest rates and bond yields are falling, not rising. Maybe the US macro outlook is falling apart. Umm, not really. 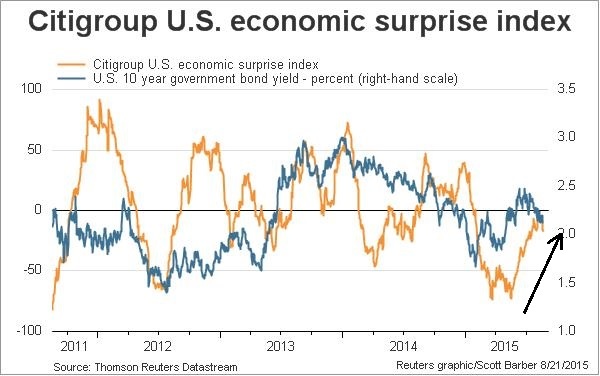 The Citigroup Economic Surprise Index has been steadily rising in the last few months, indicating that the rate of beats vs. misses in US macro data has been improving. Another proxy for slow and patient money are corporate insiders. The weekly Barron's report of insider activity shows that they have been heavily buying since mid-July. What about China? The markets have been spooked about a slowdown in China, which has the potential to drag down global growth. Institutional investors have already de-risked their portfolios in anticipation of a slowdown in Chinese growth. The BoAML Fund Manager Survey shows that these changes in institutional portfolio position has manifested themselves in many ways, such as managers selling down their emerging market weights to record low levels. Global portfolios are now underweight commodities, resource sectors and emerging markets, which are all sensitive to Chinese growth. 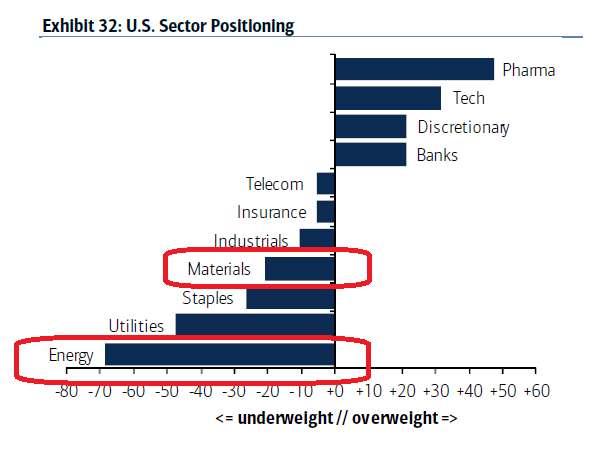 That portfolio shift is also evident in US equity portfolios, as institutions are underweight resource sectors. In fact, the underweight EM and resource positioning could be characterized as a crowded short. If for any reason we see a positive growth surprise or a shock-and-awe stimulus package from Beijing, we could see a melt-up in those groups as managers rush to unwind their underweight positions. 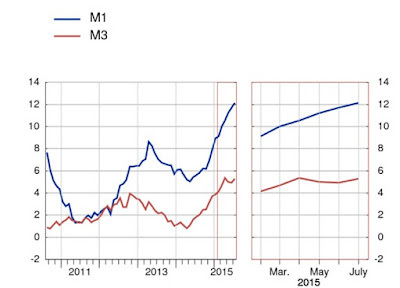 Tom Orlik showed that monetary conditions in China are changing rapidly from tight to commemorative and therefore the chance of a positive macro surprise is rising. To summarize, institutional managers lack a risk-off catalyst to sell stocks. The last major correction that occurred in 2011 was sparked by the combination of a budget impasse in Washington and heightened Greek tail-risk in the eurozone. Today, we have few macro and fundamental bearish catalysts. A recent must-read Josh Brown Fortune article summarizes how terrible things are in America (not)! This analysis suggests that once the current panic burns itself out and stock prices bounce, the bull market will continue. 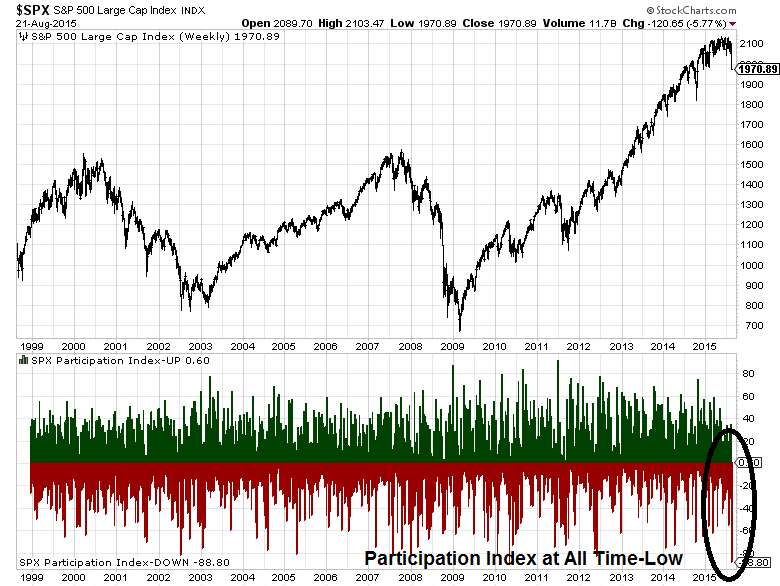 A sense of complacency, as evidenced by the lack of a 10% correction since 2011 and slowing price momentum. Should Jim Paulsen's bearish scenario come to fruition, then that might be the fundamental impetus for the weak intermediate term technical internals to resolve themselves to the downside. Nevertheless, his views represent a non-consensus call and these risks are unlikely to be discounted by the market in the immediate future. The next key milestone in this scenario is the September FOMC meeting. I therefore look upon his bear case as a potential setup to be realized in the weeks and months to come, not tomorrow. The moral of this story: Don't get overly bearish...yet. 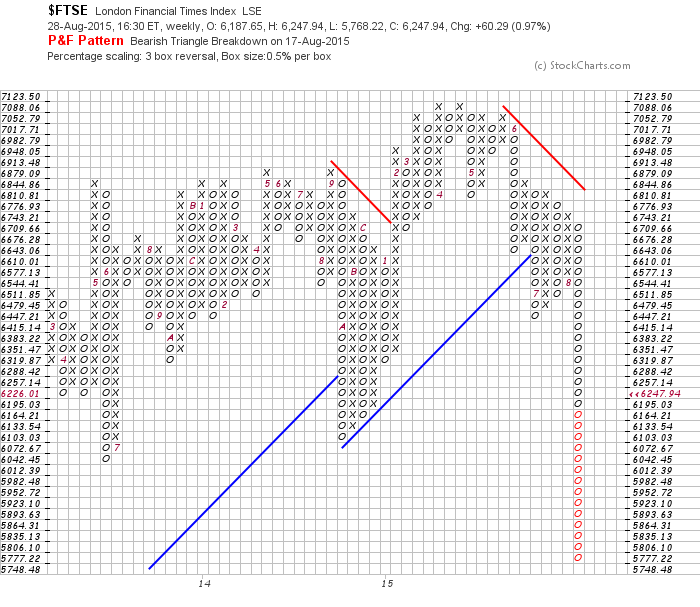 In conclusion, there are few current fundamental reasons for the current pullback. China slowdown risks have largely been discounted by institutional investors. The stock market is already seeing the terminal phase of the fast money and the margin clerks selling pressure. Once that is done, who is left to sell? When you peel away the China headline risk, what we have left in the news is the Ashley Madison data hack, which is as sensible a reason for stock market weakness as the Ebola correction last October. 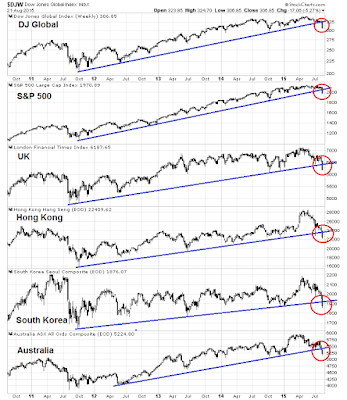 Despite the negative intermediate term technical backdrop of trend breaks and negative momentum, to stay bearish now in the face of extreme oversold and crowded short sentiment conditions is to assert that, "This time is different." The most logical conclusion is therefore an oversold melt-up that is likely to begin in the next few days. 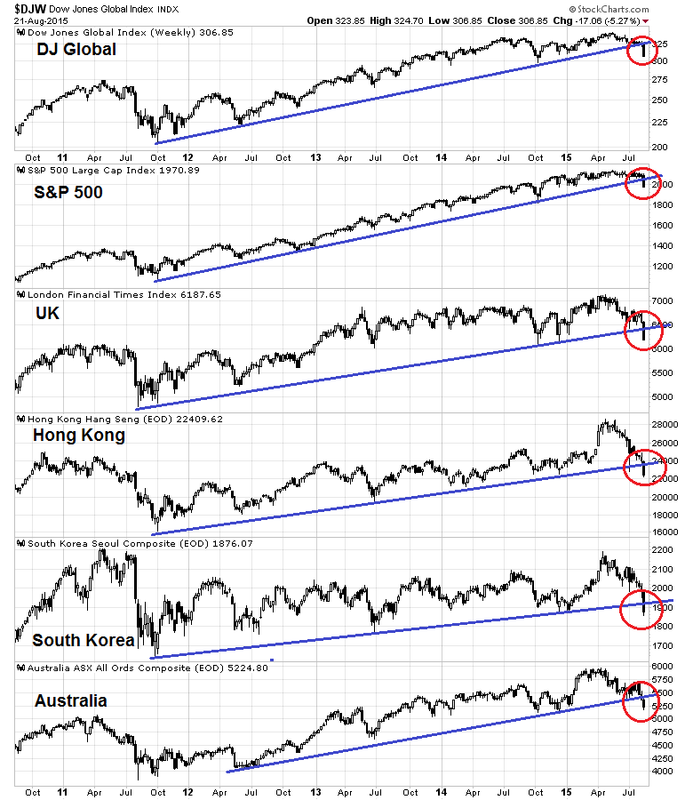 Realize, however, that stocks may not necessarily go straight up in V-shaped recovery but instead rise and decline again to re-test the initial lows before taking off. One silver lining is that despite the market carnage on Friday, we saw minor positive divergences in RSI(5) and RSI(14) on the hourly chart. Should stock prices stay at around Friday's levels, my inner investor is thinking about deploying some cash into stocks as they appeared to have gone on sale for no fundamental reason. My inner trader was unfortunately caught long in the sell-off and he is nursing his wounds. Having suffered through the pain, however, he sees no reason to change his bullish trading outlook and, in fact, he is tempted to add to his long positions at these levels. He is waiting for the bounce to see how the market behaves as stock prices strengthen after the likely two week rally that is typical of the partial two-component buy signal from the Trifecta Bottom Model. 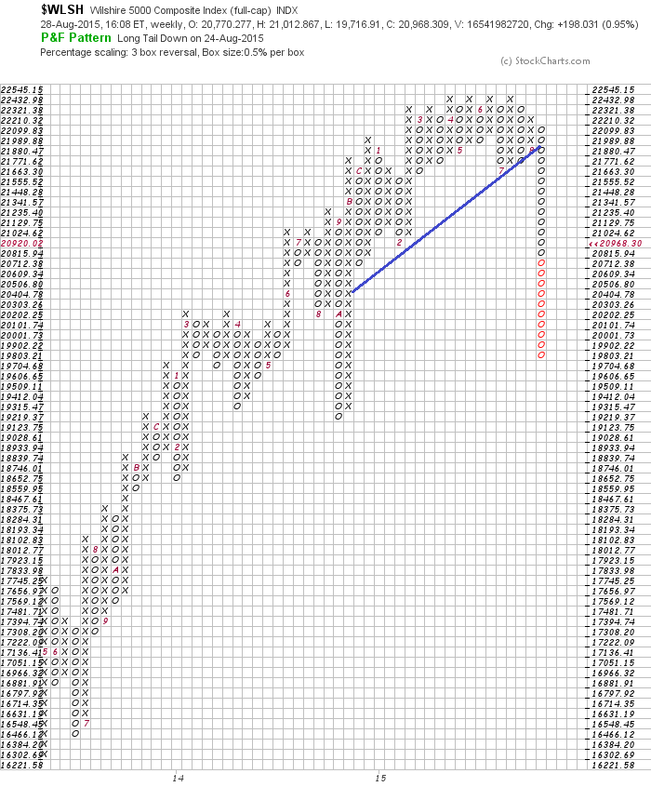 Based on that analysis, it would not be a total surprise for the SPX to recover to the 2100-2130 range. My inner trader is also keeping in the back of his head the two scenarios outlined earlier in this post, namely the neutral to bullish one with the market resumes its trading range and possibly achieves new highs, or the more bearish one where the market corrects to new lows after an oversold rally. He plans on taking things one day at a time by watching how market internals develop in the reflex rally. It is a sign of the low volatility 2015 environment that when the SPX falls by 4.5% on a peak-to-trough basis, there is a sense of panic in the air. 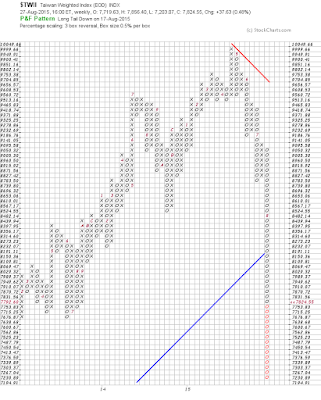 With the SPX at 2035.73, traders have to decide whether this is the start of a major correction or a short-term capitulation bottom in stock prices. With the market down about 2% today, the bear case is easy to make. China seems to be unraveling again (see my previous post Is China getting hit with THE BIG ONE?). 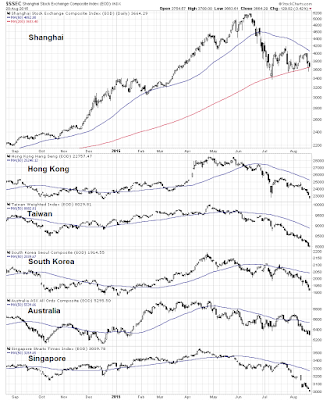 Not only is the Shanghai Composite testing its 200 day moving average (dma), the stock indices of major Chinese Asian trading partners are all trending downwards, which indicate economic weakness. Uncertain over Greece is surfacing again, as PM Alexis Tsipras has resigned and elections are being called. Junk bonds are performing badly, which is reflective of a deterioration in credit market risk appetite. 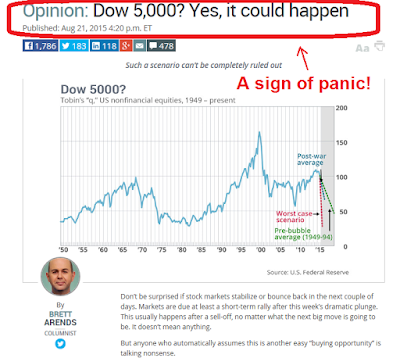 The technical conditions of the stock market are awful. I have written much about how market breadth has been deteriorating and price momentum flagging (see Bullish and bearish over different time frames). Indeed, a number of key technical "lines in the sand" have been breached. 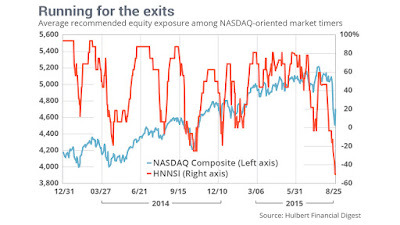 Mark Hulbert highlighted the fact that the Dow Theory has just flashed a sell signal. 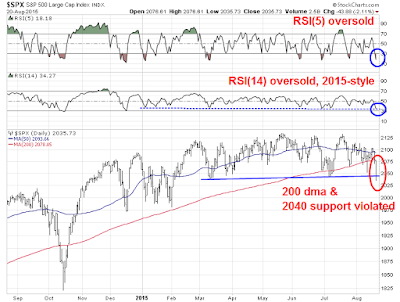 The chart below shows that the SPX fell below its 200 dma and violated a key support level at 2040. To be sure, the above chart also shows that both the RSI(5) and RSI(14) momentum indicators are in oversold territory. However, oversold markets can get even more oversold. It comes to the same question of whether the bears have seized control of the tape. In addition, to the RSI indicators shown in the chart above, numerous breadth indicators from IndexIndicators are flashing oversold readings (where the dots indicate my own estimates). This chart of SPX stocks above their 10 dma, which is a short-term indicator with a 1-3 day time horizon, are at levels where the market has bounced before in 2015. Longer term indicators (about 1 week horizon) such as the net 20-day highs-lows are at oversold extremes. 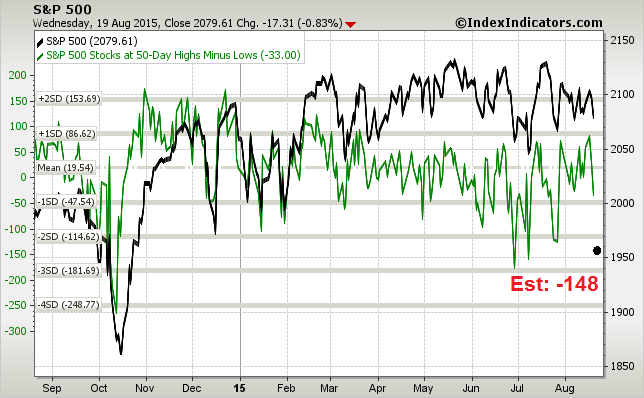 Even longer term indicators (1-3 weeks) like the net 50-day highs-lows are telling a similar story. Despite the negative tone shown by the market, bulls can be comforted by the actions of "smart money", or company insiders. The latest Barron's insider trading report, which is updated each weekend, shows that insider trading has been flashing a more or less continuous buy signal since mid-July. Many sentiment models are flashing crowded short readings as well. The NAAIM exposure report is at levels seen in recent lows, though RIAs did get even more bearish at the October 2014 lows. Chad Gassaway also pointed out that the Daily Sentiment Index (DSI) is at bearish extremes, which is contrarian bullish. 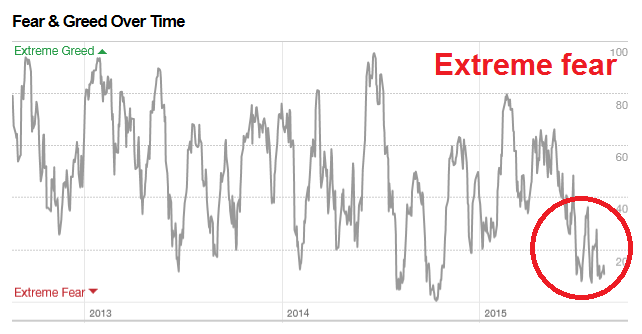 The Fear and Greed Index is also at very depressed levels. 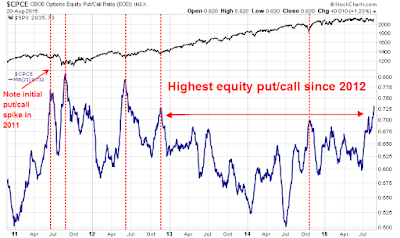 I have also pointed out before that the 10 dma ISE equity-only call/put ratio, which measures customer only opening option transactions, recently hit an all-time low, below the levels seen during the 2007-2008 bear market. The next high reading was seen on March 20, 2008 - and the SPX rallied by 10.8% before falling further into its Lehman Crisis low (see full analysis at Groundhog Day). Speaking of options, the latest 21 dma of the CBOE equity-only put/call ratio hit highs last seen in late 2012. I have highlighted past peaks of this ratio, which have coincided with market bottoms. In summary, while market internals and momentum are calling for a continuation of a market decline, sentiment, sentiment models are at bearish extremes, which is contrarian bullish. How can we explain this apparent conflict between technical and sentiment analysis? 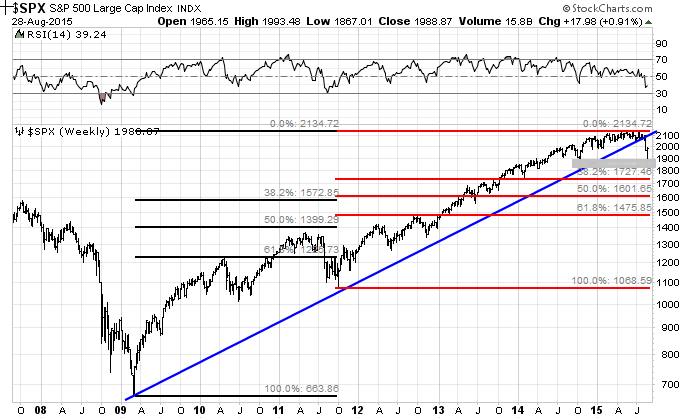 On one hand, the technical structure of the market is highly suggestive of lower stock prices in the next few months. On the other hand, sentiment conditions point to a market rally for the next 1-3 weeks. 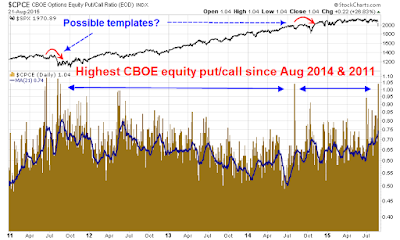 One clue to resolve this problem can be found in the above chart of the 21 dma of the CBOE equity-only put/call ratio. This ratio hit a high in the summer of 2011, where the market rallied and then fell into its ultimate low for that year. I believe that is the most likely analogue for the current conditions of the stock market. Otherwise, we are left with a second possibility that these extreme sentiment measures resolve themselves with the market bottoming in the next few days and rallies to put us back into the same old frustrating range-bound conditions seen in all of 2015. As for what is likely to happen next, here is my roadmap, which can change as market conditions change. My trifecta model (described at Time for a market bounce?) 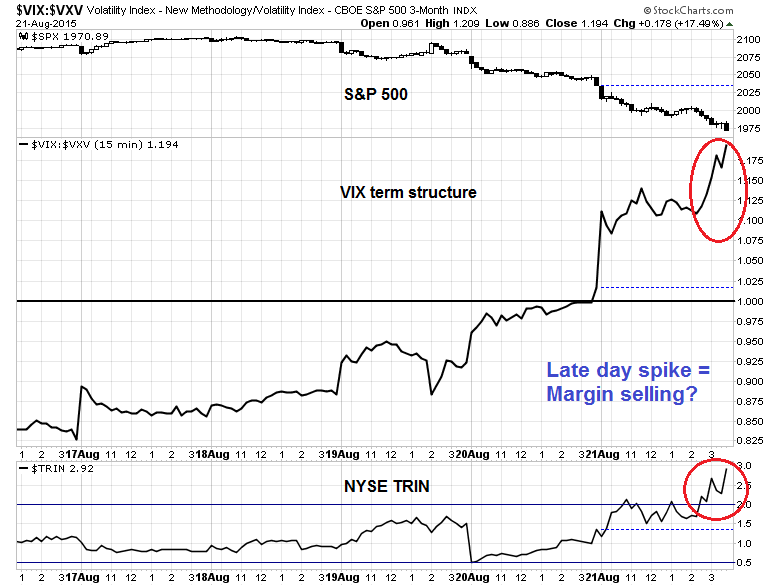 shows the short-term technical conditions of the market. 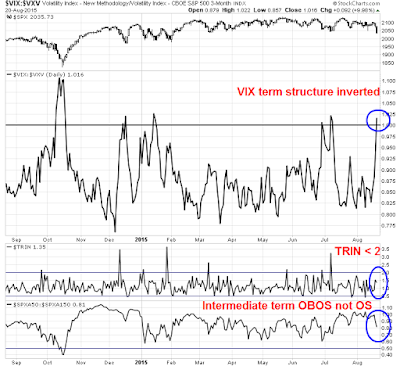 The term structure of the VIX Index has inverted, indicating heightened fear. On the other hand, a TRIN spike over 2 hasn't happened yet, which can be indicative of a "margin clerk" forced liquidation market which washes out the weak holders. 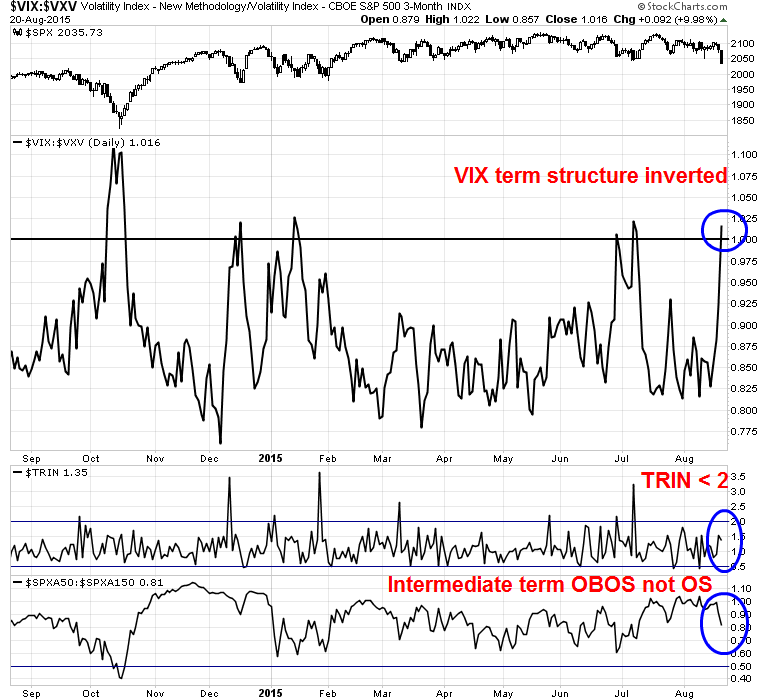 The last Trifecta component, the intermediate term OBOS model is nowhere near an oversold reading of 0.5. Usually, we need to see two of the three Trifecta elements flash buy before a durable bottom can be (on a multi-week time horizon). My base case scenario calls for the current combination of oversold and crowded short readings to spark a market bottom in the next few days, after which the market will see a melt-up recovery. The resulting rally will flush out any bears who are short, which gives room for the intermediate term technical indicators to push stock prices into their long awaited final correction. In other words, expect a market of maximum frustration for directional traders in the coming weeks. In the meantime, I will be watching my Trifecta model very carefully for signs of capitulation.